Food and Feed Grade Sodium Pyrophosphate (CAS NO 7722-88-5) is white powder with good solubility in water. Water solution of high quality sodium pyrophosphate is alkaline, and stable under 70 celsius degree, while decomposed of disodium hydrogen phosphate when boiled. 1. Used as quality improver, emulsifier, buffering agent and chelating agent for food production. 2. Used as fungicide, acidity regulator and quality improver for pet feed. N.W. 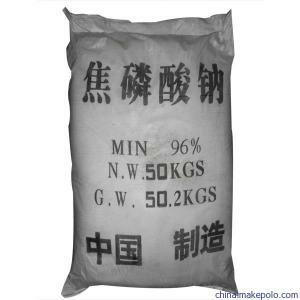 50KGS/Bag, or according to customers` requirement. Looking for ideal Feed Grade Sodium Pyrophosphate Manufacturer & supplier ? We have a wide selection at great prices to help you get creative. All the High Quality Sodium Pyrophosphate are quality guaranteed. We are China Origin Factory of CAS NO 7722-88-5. If you have any question, please feel free to contact us.